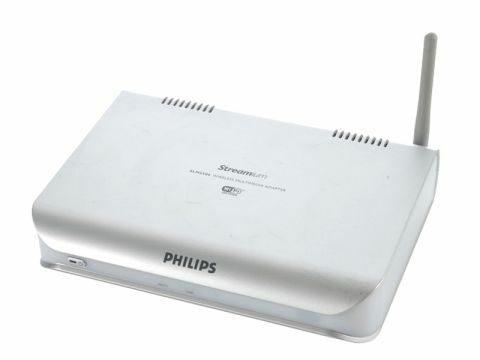 One thing that's immediately noticeable about Philips' Streamium SLM5500 is that it lacks an HDMI port, so you'll need to use Component if you want HD output. The only other video output is SCART, and depending on your choice of outputs you'll have to move a switch on the rear of the unit. Presumably, unless your TV has an S/PDIF input - and we've not seen any that do - you'll need to route sound through an amplifier because there's no analogue output. Although the Streamium has both 802.11g and Ethernet connectivity, it's bereft of USB ports. In addition, the supplied software wouldn't install under Vista, so we had to use an XP machine instead. Once connected to your network and the server software is installed, the Streamium can play back items from your media library. Image load times aren't the slowest, but compared to the Xbox they're positively sloth-like. Image quality isn't that impressive, either. The Streamium coped with most video formats we tried, including DivX and XviD. However, large files streamed over the wireless link do tend to pause as the buffers stream empties. It's not a problem isolated to the Streamium - after all, you really need 802.11n to view HD - but because there are no USB ports you can't even plug in a removable drive. There's some Internet content in the form of Radio stations and picture libraries, although these are very American in tone and you end up wondering what the point is. Overall, the Streamium SLM5500 is easy to use, but its lack of features means that it's outclassed by many of its peers.